The Commission of Inquiry into State Capture says it will not be using the services of GTS which provided security services to the commission. This follows an investigation by Commission and the Department of Justice and Constitutional Development into the procurement procedures in regard to GTS. The investigation revealed that GTS is connected to Bosasa. The latter company has for many years been accused of corruption. The commission says in a statement that GTS has been asked to remove its equipment from the premises of the commission. The investigation into GTS came about after City Press newspaper published an article in which stated that had been appointed or contracted by the Department of Justice and Constitutional Development to provide security services to the Commission in July last year. The article questioned how a subsidiary of Bosasa could have been appointed or contracted to provide services to the Commission in the light of the fact that over many years there had been many allegations of corruption made in the media against Bosasa. The article also alleged that procurement procedures were not followed. Following upon the City Press article, the Chairperson of the Commission Deputy Chief Justice Raymond Zondo undertook to look into how it had come about that GTS was providing services to the Commission and indicated that the Commission would inform the public once it had been established how this had come about. GTS was temporarily stopped from providing security services to the Commission until investigation had been undertaken in to the matter. “ The allegations made in the City Press article made it necessary to establish who had been responsible for getting GTS to provide services to the Commission and whether procurement requirements had been complied with and, if they were not complied with, what the explanation was for such non-compliance,” the commission says in a statement. Minister of Justice and Constitutional Development is expected to inform the public in greater detail of the outcome of the investigation. 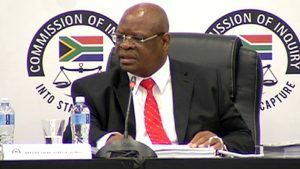 The post State Capture Inquiry terminates GTS services appeared first on SABC News – Breaking news, special reports, world, business, sport coverage of all South African current events. Africa's news leader..